Spring will soon be here! Even though January and February are some of the coldest winter months, I love to cross off the days as a countdown to spring and summer. Every day means a little bit more sunlight and a promise of warmer weather. Lilly Pulitzer just released their spring collection and it is a winner! Later this week I'll give you a fit guide to let you know how the sizes are running since that was a very popular post for the last resort delivery. I am loving the a-line silhouettes and luxe fabrics that scream resort chic! The Briella dress in Flutter Blue Chin Chin Stripe is figure flattering in a Posh Ponte knit that won't wrinkle or rumple. You'll look perfectly polished all day in this comfortable dress. Another dress that will flatter every body type is the Rylan Dress in Neon Pink Metallic boucle. This dress continues the trend of luxe fabric with a metallic boucle in a pretty pink. I'm thinking that this dress would be lovely for Easter. I really appreciate the styles for spring because they are things that women of all ages can wear. The little cap sleeves are appropriate for any setting. I've always been a huge fan of the Marie Kate dress from Lilly Pulitzer, but this season, the dress offers a nice improvement over previous seasons. At 5'4" on a good day, I'm far from tall, but in the past, Marie Kate was super short on me. I sized up in the dress in order to get a little bit of extra length. The spring collections Marie Kate dress in Battenburg lace in Flutter Blue has a longer length! Yay! Bloomingdales offers a fabulous gift with purchase opportunity right now as an incentive to build your spring wardrobe. 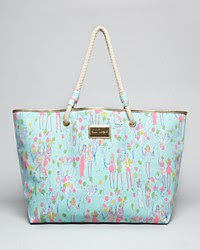 Get this adorable tote with a $500 purchase of regularly priced Lilly! As if all of these glimpses of spring were not enough excitement for your day, set your clocks for 9 p.m. tonight! Joss and Main features Janie Schoenborn from Lilly Pulitzer tonight with a special curated collection. You're probably already familiar with their fabulous flash sales, but if not, here's your invitation. I absolutely love the spring collection so far. I can't get enough of the new prints! It is all so fabulous and bright! Also .. I was told that only the new Tabitha dress (sleeveless version of the Marie Kate) is longer .. the Marie Kate is the same length as in previous years. I did try on the Tabitha at our trunk show and it does seem to be longer.